Hi everyone! For day 23 of the 31 Day Challenge my nails are inspired by the movie My Neighbor Totoro. It's impossible not to love all the cute characters in it! :3 So on my ringfigner I made the giant totoro. First I applied three coats of China Glaze Recycle (which I'm also wearing on the rest of my nails), then I used a striper polish in black to outline the head and ears. Finally I added the eyes, whiskers and other details and my cutie was complete. ^_^ Thanks for reading! 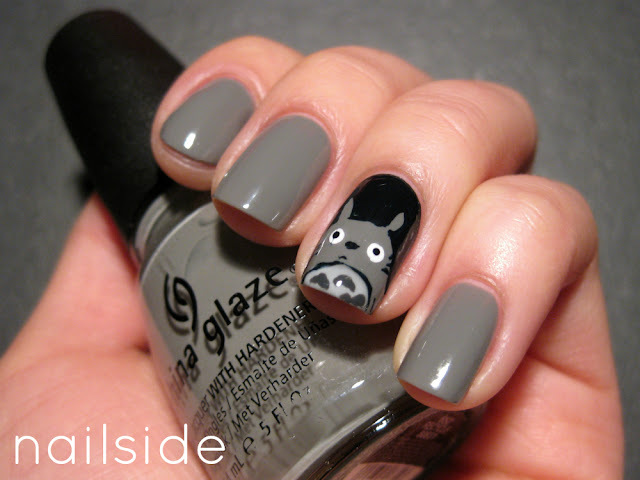 Totoro is my favourite! I did similar nails once. So cute! So adorable! We love this movie at my house! OMG! I love Totoro, great mani! Oh my goodness that is amazing! Totoro is my all time favourite movie! *Obsessing*!!! I love it! Totoro ist so cute! Ohhhhhh!!! Totoroooo! I love Hayao Miyazaki's movies! This is just amazing! Oh my gosh this is adorable!